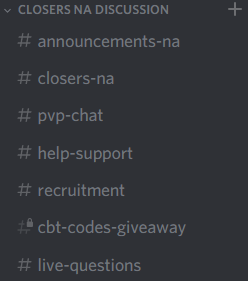 Three times the charm, the third giveaway of Closers NA CBT Codes! Again, thank you guys for participating in the second giveaway and sorry that this giveaway came so late. I had a lot of things to do including Wolfgang SA and etc, so do forgive me. I won't write down the winners here; I announced them over on Discord. Congratulations to those of you that won! Onto the third part of the giveaway. It will be the same format as the others, and again, it will be from the draw of 1 to 1111. This time, it will be dedicated to YuruYuri. 4. In that channel, post any kind of picture for Yuri- regardless of screenshot, fanart, official illustration, etc. Do NOT post a NSFW art! We will also be having continuous giveaways throughout CBT for those who haven't won the giveaway, so watch out for future giveaways to come. Also, when I'm feeling the mood, I also sometimes do sneaky limited time secret giveaways on the Discord as well. So keep your eyes peeled on that #announcements-na channel!